Image as a quality car on the Hyundai i10 Grand've heard from continental of Europe. partly because this car has been certified four-star safety rating from Euro NCAP in mid May 2014. Grand i10 itself is projected for the European market. No wonder this car was designed Thomas Buerkle, Hyundai's European designers. 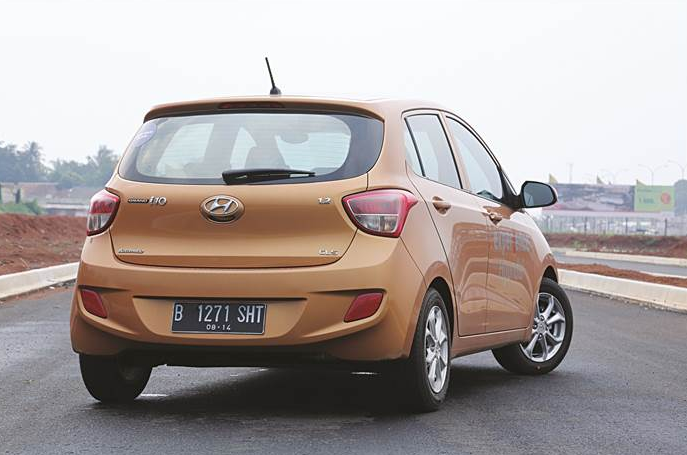 With various advantages earlier, Grand i10 certainly has great potential to be accepted in the Indonesian market. 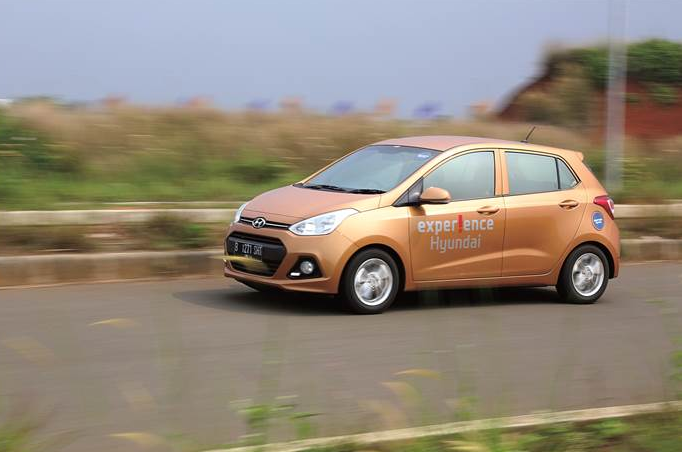 Here Hyundai i10 Grand presenting three variants, namely GL M / T, GLS M / T, and GLS A / T.
With the price tag, this city car fight in the competitive class. One is a strong competitor, the Honda Brio Sport EM / t which was only slightly more expensive than the Grand i10 GLS A / T.
Actually, when we buy a car, not only the price of the key considerations. Quality means the car was a consideration, or in other words, the value (value) which represented the vehicle is worth the sale price offered. Hyundai Grand i10, we think has value needed to be taken into account. Grand Designs i10 is very different from its predecessor. Its design is accented with New Wide Hexagonal Grille that characterizes the current Hyundai global products. Modern impression is also displayed on the car with embedded lights Daytime running Lights (DRL) below the fog lamp. Pull a straight line from front to back and the curve of the body on the side shows the sporty impression of this car. Trestle alloy wheels wrapped in tires size 165/65 eight R14 looks ideal body proportions Grand tiny i10. On the back there are some ornaments that make this city car looks gorgeous. The latest design of the rear lights with reflector technology Multi Focus Head Lamp showed decisive impression. The LED type stop lamp lights also add to the impression of dynamic rearspoilernya back Grand i10. Grand i10 city car as the car looks small from the exterior appearance. but when entered into and slid behind the wheel, the impression does not feel cramped at all. The driving position is also quite comfortable and not too low, providing good visibility in any direction. The view to the front to be more flexible, as well as views to the side and a third rear-view mirror for visibility to the rear. The entertainment feature in the cabin is delivered equipped Multimedia Entertainment Set 6 inches touch screen monitor, with Bluetooth, 3G ready and the internet, and GPS navigation. Unfortunately, the dashboard and door trim materials appear to have a less than optimal quality. Similarly, the seats are thin and give the impression of less comfortable. For rear passengers, the second row is quite roomy for adults occupied with leg room freely. Rear trunk is also not as small as one might imagine, at least two medium-sized suitcases can enter easily. 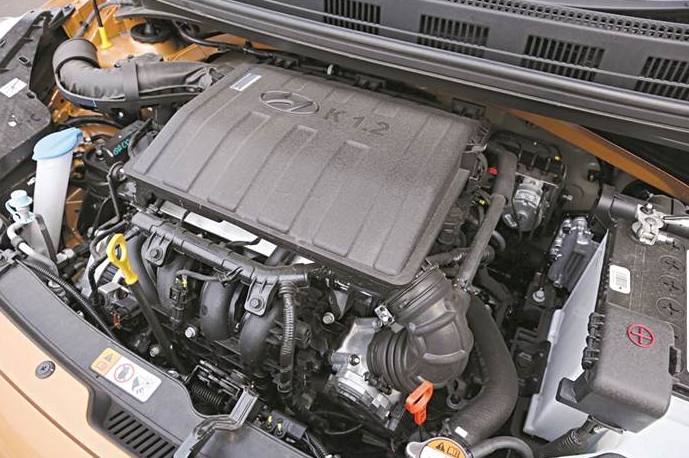 Hyundai Grand DCVVt i10 Kappa engine has 1,248 cc with a power peak of 85 hp at 6,000 rpm, and torque of 119 Nm at 4,000 rpm. Output power and torque is channeled through 5 speeds Shiftronic automatic transmission. This machine provides a level of responsiveness is quite good at the run-down, and the displacement of the transmission is quite smooth. Moreover, thanks to the Multi Driven Power Steering (MDPS), driving becomes very fun and agile in urban areas. The weight of the wheel lighter but still sharp. Shiftronic transmission also driving more fun when operated manually. Displacement was slightly faster than the automatic mode. Combined fuel consumption is also quite economical, when we use an kemacet penetrated after work, the screen shows the information 14.4 kpl figures. strength may be only 85 hp, but it can be said to be sluggish acceleration. 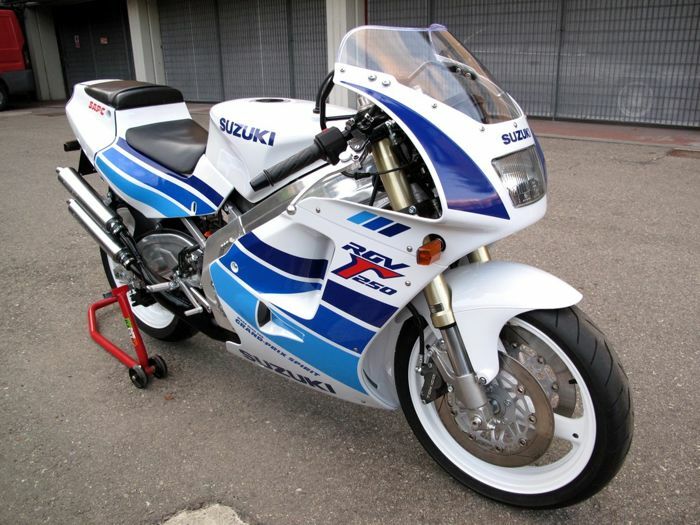 Speed ​​of 120 kph can be easily achieved on the freeway. Feel safe and comfortable driving is also obtained from the Grand i10 safety features that have been tested. 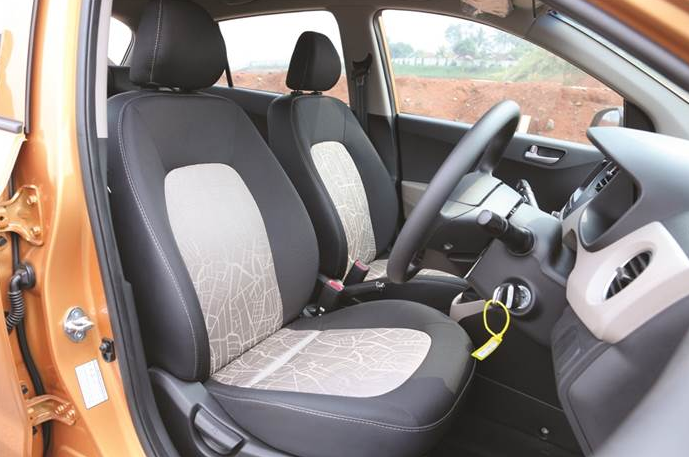 availability features such as ABS, HrRS (reinforced Hyundai Body Structure) of steel in the body to withstand impact and single airbag on the part of the driver. speed sensing some features that will lock the door automatically when the car drove over the speed of 20 kph. With safety features that is qualified and practicality level of flexibility it offers space, Grand i10 should be able to succeed against its rivals from Japan.